We have a an active thread going on discussing what you do with all your flies (see below) so that got me to thinking that maybe it is time to start a thread requesting flies for both Project Healing Waters and Casting for Recovery programs. If you have any flies that you would like to donate or are willing to tie up six or maybe a dozen for those two great organizations, that would be wonderful. The flies don't need to be all the same pattern, but they do need to be unused flies. I already have two dozen streamers that Eunan has donated from the recent swap and JP has also donated his flies, which are in the mail system at the moment. The Project Healing Waters fly donation will be going to the group at Fort Belvior for the Wounded Warriors Program (thanks to Silver for reminding me of that great group of folks in need of some flies). At this point I'm not sure whether or not the Wyoming Casting for Recovery program will need flies or not for this years retreat, the gal that runs that program has been busy caring for her husband who is undergoing treatment for throat cancer (non-smoker), so at this point I will just collect flies for CFR in general, not knowing which organization will receive the flies. If your willing to donate flies to either Project Healing Waters or Casting for Recovery, send me a PM and I will forward my address. What do you do with all the flies? 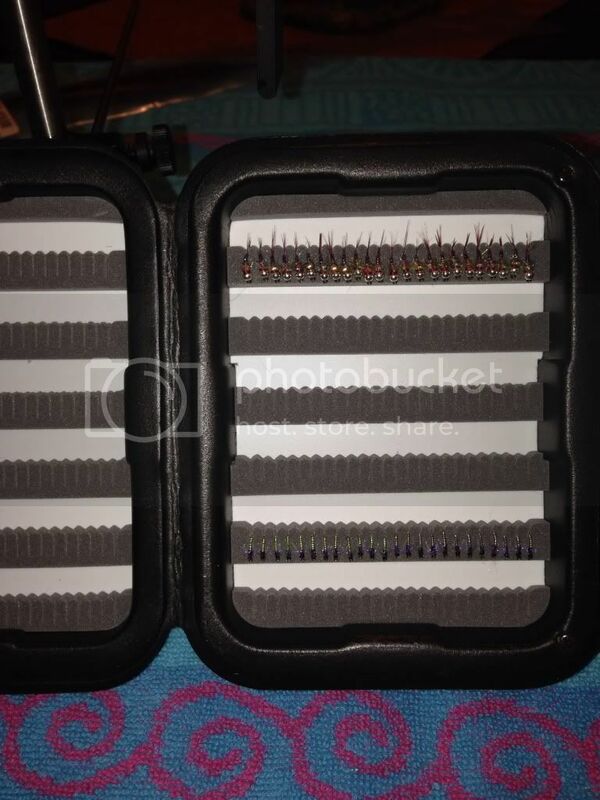 hairwing530 & his kids.......two each 2014 "Fly Box 80" collection flies received! Last edited by mcnerney; 04-30-2014 at 06:51 PM. Thanks in advance! No need to hurry, I'm asking for flies do be distributed to PHW and CFR in the late spring time frame (probably late April), so we have several months to tie. Physically unable to tie at this point (Parkinson's) but how about fly boxes? Fred: We totally understand you can no longer tie, but I'm sure the folks at PHW or CFR would love a fly box donation from you! Much appreciated for the gift. Do you know if these events are strictly trout fishing? I am going to tie some stuff to send with my swap flies that are leaving here real soon. Have a brand new Wheatley on my desk and will pick up a few more 'boxes' next week and forward on. Saw your PM but not going to open same so I don't do something stupid and loose your address. Count me in, great way to support my Brothers and Sisters in Arms who are having a rougher time then I am. My signature line: ""We sleep soundly in our beds because rough men stand ready in the night to visit violence on those who would do us harm." – Winston Churchill"
Nothing has changed in 50-60 years. 'Bless them all, Bless them all, the young the long, the short and the tall ...."
Dewayne: The Casting for Recovery retreats are all trout, not sure of the PHWs, but I think they would gladly accept anything we can provide them. Thanks, much appreciated! I sent a PM with my address to send the flies to, just realize there is no hurry, we will be collecting flies until April 2014. A Big Thanks from Project Healing Waters!